Hyperion Books for Children, 2016. 60 pages. First, let me talk about the new series this book introduces: Mo Willems’ Elephant & Piggie Like Reading. There are four pages at the front and four pages at the back where our beloved Gerald and Piggie talk about reading the book. The title page has a picture of Gerald holding the very book, ready to open it up and read it. Now I’m not crazy about this frame – Just a little bit of Elephant and Piggie is not enough! Fortunately, they did choose excellent authors for the books-within-a-book, so this wasn’t a way to pass off any old thing and sell it with the Mo Willems brand. The Pigeon is even hiding on the back end papers, just as he does in the regular Elephant and Piggie books. But what I love about The Cookie Fiasco are the mathematical implications! This book reminds me of the classic The Doorbell Rang, by Pat Hutchens. Like that book, it’s a simple story that small children can enjoy – but you can pull it out later when they’re learning about fractions and make multiple applications and elucidations. 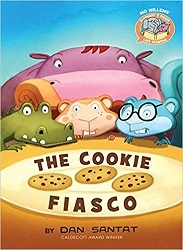 The story is simple: Hippo, Croc, and two Squirrels have three cookies. Four animals, three cookies. They discuss how to share the cookies, but nothing seems fair. While they are discussing the options, Hippo nervously starts breaking the cookies in half. Then they have six cookie pieces, but still four friends. It’s still not fair. While they continue to discuss, Hippo continues to break the pieces. After a while they have twelve pieces, and realize that each one can have three pieces. Problem solved! Equal cookies for all! There is a grand page of munching cookies – and then a cow shows up with three glasses of milk. Uh-oh! The only thing wrong with this book is the one Gerald points out in the frame at the end – It may make you hungry for cookies. It’s a simple, silly story. You don’t need to talk about the math behind it at all. But someday, when a child is learning to divide three by four, you can use this as a lovely illustration. And similar fractions. There’s even room for talking about common denominators. I'd love for this book to get a mention in the next set of Mathical Awards, I liked it so much.